Sao Paulo Futebol Clube are the youngest of the major teams from the capital of Sao Paulo state, an area in constant development which already accommodates over 40% of Brazilian industry. 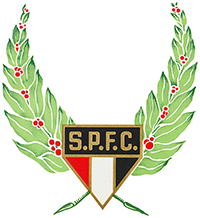 Founded by Edgar Souza Aranha on 27 January 1930, Sao Paulo struggled for a long time to earn themselves a place in the sun alongside the state's two traditional giants, Corinthians and Palmeiras. Nevertheless, the club's motto "Football is an art, we have another approach to the game" quickly helped them build a fan base of loyal Torcedores. And taking to the field in a white shirt with a black and red horizontal stripe across the front, the team benefited no end in the early days from two extraordinary talents. First of all, legendary goalscorer Artur Friedenreich netted an incredible 1,329 strikes in a 26-year career to become the darling of the crowds packed into Sao Paulo stadium, known more commonly as Morumbi stadium. Officially, the ground holds a maximum of 80,500 supporters. Either way, they were soon being dazzled by the skills of Leonidas da Silva, the 'black diamond', who made his debut for Sao Paulo on 1 April 1942. By the time he retired on 30 October 1951, the extremely agile and seemingly elastic striker had scored 140 goals in 211 games, many of them thanks to his speciality - the bicycle kick. His record with the Brazilian national team was perhaps even more impressive, and he struck for the Seleçao at the rate of a goal per game, scoring 25 in 25 appearances. Thanks to these exceptional players, a list which should also include Brazilian captain Carlos Bauer, Sao Paulo won themselves a steady stream of titles. But the club's real heyday came in their third era of sustained success - the 1990s - as coach Tele Santana and elegant midfielder Raï drove them to success at home and abroad. Adding a third Copa Libertadores triumph to their list of honours in 2004, Sao Paulo have managed to remain true to their motto over the years, proving that football is the most thrilling of games when played in the proper spirit. The 1992 Toyota Cup final brought together Sao Paulo and Barcelona, two teams who had never represented their continents before. And it was the Catalans, coached by Johan Cruyff, who took a quick lead when Josep Guardiola threaded a superb ball through for Hristo Stoitchkov to score (12'). The Brazilians were back on level terms soon enough, though, when Raï expertly finished off a move started by his powerful team-mate Muller (27'). Having only arrived in Tokyo three days before the match, Barcelona began to fade after the break as tiredness got the better of them. It came as little surprise, then, when Raï fired in the winner to seal Sao Paulo's first-ever Toyota Cup win. And they were back in Japan the following year too, where they came up against European runners-up AC Milan. The Rossoneri had been beaten by Olympique de Marseille in the European Cup final earlier that summer, but the French outfit's federation suspended them on account of corruption in their league campaign. The resulting clash has gone down in the annals of the game as one of the most spectacular matches in history. Sao Paulo went in at the interval a goal to the good thanks to Palhinha, who had been well-served by Cafu, but things really exploded into life in the second-half. Daniele Massaro equalised for Milan soon after the restart (48'), only for the pendulum to swing back in Sao Paulo's favour 11 minutes later when Leonardo fed team-mate Toninho Cerezo to net his side's second. Massaro was in superb form for the Italians, however, and he set up Jean-Pierre Papin with nine minutes remaining. The game then seemed to be heading inexorably towards extra-time, but Muller had the final say with a late strike that gifted Sao Paulo their second consecutive intercontinental win. Younger brother of the great Socrates, Raï Souza Vieira de Oliveira was Sao Paulo's inspirational leader in the 1990s. Standing 1.89m tall and weighing 88 kg, he was a powerful and athletic player, but allied those qualities with an astonishing elegance and intelligence that saw him become captain of the Brazil team at just 22. In five-and-a-half years with Sao Paulo he scored 103 goals (including two in the 1992 Toyota Cup final), helping the club to a Brazilian championship title, three Sao Paulo state championships, two Copas Libertadores and the 1992 Toyota Cup. He left to join French side Paris Saint-Germain in September 1993, but was back to wear his old club's colours again in the summer of 1998. Born in Belo Horizonte on 21 April 1956, Cerezo began his career with Atletico Mineiro and Sao Paulo before being called up by the Seleçao to contest the 1978 and 1982 FIFA World Cups TM in Argentina and Spain. Alongside Socrates, Falcao and Zico on Spanish soil, he featured in one of the most brilliantly-balanced midfields in football history. However, it was his mistake that helped Italy to victory (2-3) in the second round of that tournament. He then took his talents to Italy for stints with Roma and Sampdoria, and he picked up a raft of titles before returning to Brazil in 1992 for a memorable final chapter with Sao Paulo. Toninho Cerezo called time on his career in 1994 and turned his hand to coaching, most notably working in Japan. Tele Santana was the man behind the 'cultural revolution' at Sao Paulo. Widely regarded as one of the best coaches on the planet, he was always a leading advocate of attacking football, and hoped the spectators watching would take as much joy from the game as the players. A former player himself with Fluminense, Madureira, Guarani and Vasco de Gama, he nonetheless shone most brightly in the dugout, bossing Atletico Mineras gerais and Gremio, not to mention the Brazil team at the 1982 and 1986 FIFA World Cups. Strangely enough, though, Santana came to Sao Paulo after a spell with the Saudi Arabian national side. But between 1989 and 1993 he won all there was to win with Sao Paulo on both the national and international stage, where his message had never been so well received. 13 December 1992 in Tokyo. Sao Paulo FC beat Barcelona 2-1. Referee: Juan Carlos Loustau (ARG). Goals: Sao Paulo: Rai (27', 78') Barcelona: Stoitchkov (12'). Sao Paulo FC: Zetti, Vitor, Ronaldo, Ronaldo Luiz, Adilson, Cafu, Pintado, Rai, Toninho Cerezo, Muller, Palhinha. Barcelona: Zubizarreta, Ferrer, Koeman, Eusebio, Bakero, Guardiola, Amor, Laudrup, Witschge, Stoitchkov, Begiristain. Man of the match: Rai (Sao Paulo FC). 12 December 1993 in Tokyo. Sao Paulo beat AC Milan 3-2. Sao Paulo: Zetti, Cafu, Ronaldo, Valber, Andre, Toninho Cerezo, Dinho, Doriva, Leonardo, Palhinha, Muller. AC Milan: Rossi, Panucci, Baresi, Costacurta, Maldini, Desailly, Albertini, Donadoni, Massaro, Papin, Raducioiu. Man of the match: Toninho Cerezo (Sao Paulo FC). Copa Libertadores' champions for a third time in 2005, Sao Paulo were back in Japan to contest the revamped FIFA Club World Championship between 11-18 December. The Brazilians were handed a bye into the semi-finals of the six-team competition where they defeated Al Ittihad of Saudi Arabia 3-2. They were very much the underdogs in the final against a Liverpool side that had not conceded for 11 matches but thanks to a 27th-minute goal from Mineiro, an inspirational display from goalkeeping captain Rogerio Ceni and a slice of good fortune, Paulo Autuori's charges emerged victorious. With a club record of over 600 appearances in 13 years with the Tricolores, goalkeeper Rogerio Ceni is the undisputed hero of the Paulista faithful. Much of his fame comes from his goalkeeping ability from set-pieces and on his return to Japan he once again found the net with a penalty in the 3-2 semi-final win against Al Ittihad. There was not much chance of the charismatic keeper getting up the field in the final, but, fortunately for Sao Paulo, Ceni's handling skills came to the fore. He produced save after save in a remarkable display to keep a clean sheet and scoop both adidas Golden Ball and Toyota awards. Coach Paulo Autuori was undoubtedly the key to Sao Paulo 's third Copa Libertadores triumph. The man from Rio de Janeiro took over from Emerson Leao at the end of the group phase, heralding a new chapter in an impressive coaching career that includes leading Cruzeiro to Libertadores glory in 1997. Autuori joined the Tricolor just a few weeks after resigning as Peru coach, and had an immediate impact on his new team's defensive record. That tactical ability was nowhere better displayed than in the way he organised his troops to withstand the wave upon wave of Liverpool attack in the CWC final. So impressed were the watching Japanese that immediately after the tournament Autuori was offered a lucrative deal to take over J-league side Kashima Antlers. 18 December 2005 in Yokohama. Sao Paulo: Rogerio Ceni, Cicinho, Fabao, Edcarlos, Diego Lugano, Junior, Mineiro, Josue, Danilo, Amoroso, Aloisio. Liverpool: Jose Manuel Reina, Stephen Warnock, Steve Finnan, Jamie Carragher, Sami Hyypia, Momo Sissoko, Steven Gerrard, Xabi Alonso, Harry Kewell, Fernando Morientes. Player of the tournament: Rogerio Ceni (Sao Paulo). I do accept as true with all the ideas you've offered on your post. They are very convincing and can definitely work. Still, the posts are too quick for novices. May you please lengthen them a little from next time? Thanks for the post.